This PDF pattern includes sizes Small, Medium & Large; with a head circumference range of 21 1/8"- 22 7/8"
Suitable for beginners/ intermediate sewists. THIS IS A SEWING PATTERN- INSTANT DOWNLOAD. NOT A FINISHED ACCESSORY ITEM. Sew your Own Hat and make it Unique to YOU. ~ This is a PDF sewing pattern that you print out to use. It includes cutting and sewing instructions with a step-by-step photo tutorial. ~ It is one file that you will be able to download as soon as your payment is confirmed. ~ The pattern pieces are all professionally drawn by CAD illustrations - this is a very professional pattern tutorial. ~ I try to make the instructions easy to follow along with simple wording, making sewing a fun project! Get creative! ~ This hat should be sewn with a mid-weight woven material. 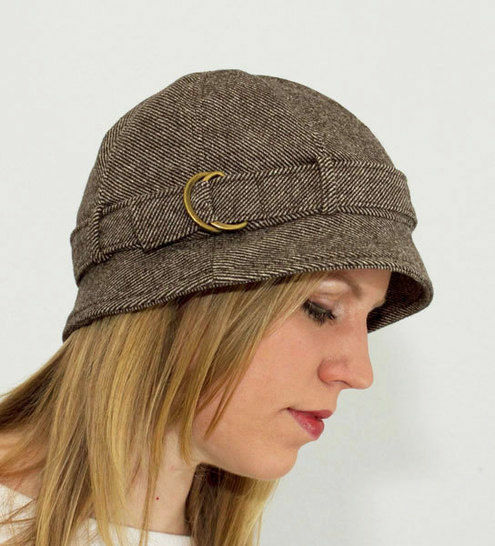 ~ This hat is fully lined with a satin or basic lining material. ~ This pattern includes sizes Small, Medium & Large; with a head circumference range of 21 1/8"- 22 7/8". ~ I LOVE this hat- I wear it all throughout the Fall, Winter and Spring. If you use a cotton, it can also make a super cute summer hat. These patterns cannot be used in mass production and are for your personal use only. However, if you are selling smaller handmade quantities, you may use this as long as you give credit stating: "Pattern by Gina Renee Designs"
This hat should be sewn with a mid-weight woven material. Yardage needed lining = 1/4 yard (42/44“ wide) regular polyester lining or satin lining is good. Yardage needed for combo fabric = 1/8 yard (42/44” wide) muslin or cotton broadcloth is good. Yardage needed for fusible interlining = 1/3 yard (36“ wide.